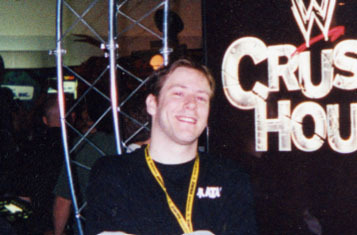 Picture of me at the 2002 E3, standing in front of the WWE Crush Hour sign, which was the game I was working on at the time. I am currently a software engineer at the new iteration of Big Huge Games, working on DomiNations, a free-to-play strategy game for Android and iOS platforms. Also see the Famicom completion list. C++ This user develops games professionally. U.P. This user is a University of Pennsylvania alumnus. This user contributes Fighting Games Moves. This user is a retrogamer. 39 This user is 39 years old. teh This user has trouble spelling sometimes. MAME This user has a MAME cabinet. for the ridiculous number of guides you've contributed. for absolutely wonderful work on the Pokemon RBY Walkthrough. Babel no Tou Pro stages. This page was last edited on 3 June 2015, at 13:27.